We call these spicy because of all the aromatic spices that we used: cumin, coriander, turmeric, paprika, ginger, black pepper, and curry powder. If you are a spice junkie, then definitely bring your own hot chilli sauce if you are going to eat the burritos we prepared. 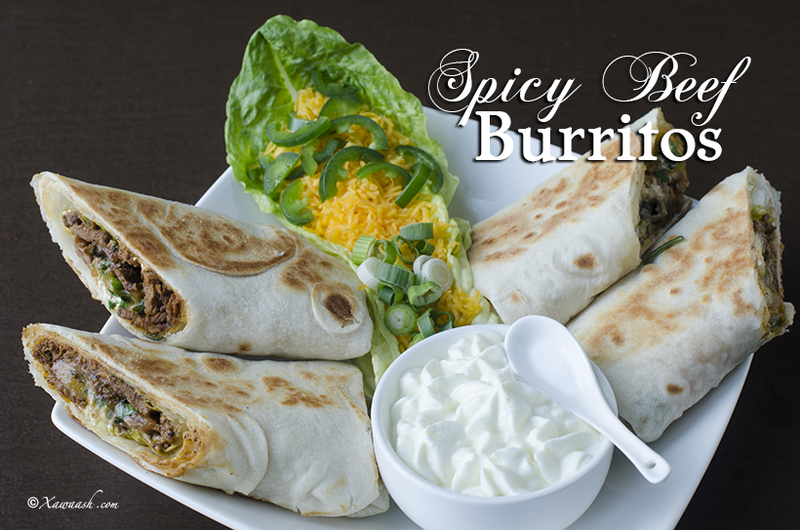 If you are making your own and would like your burritos to have an extra kick, use hot curry powder, do not seed the jalapenos, or better yet use habaneros. Partially freeze the beef, thinly slice across the grain then cut into strips. 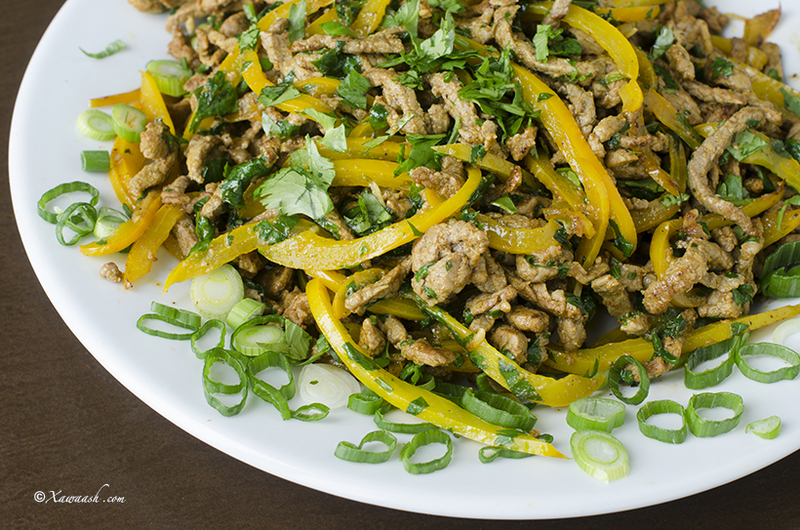 We stir-fried the beef in very little oil and it was so tender that it just melted in the mouth. 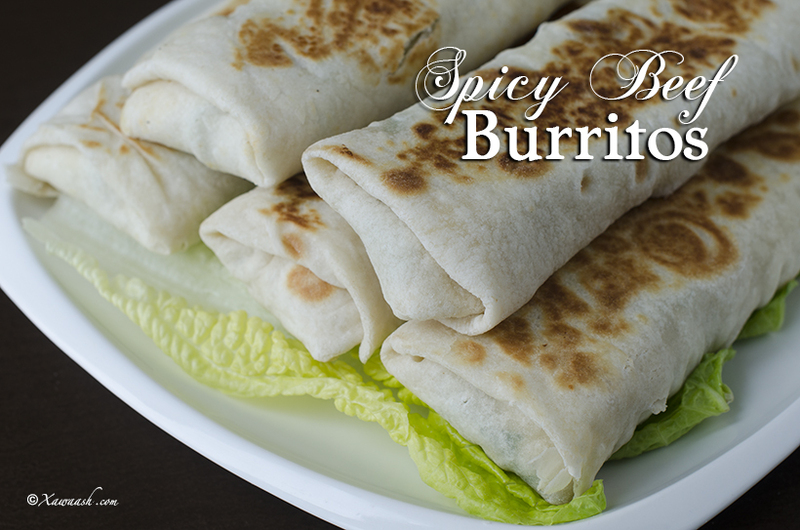 The cilantro, lettuce, green onions, and the yogurt sauce make these burritos fresh-tasting. We used fresh, homemade tortillas and the result was nothing short of spectacular. 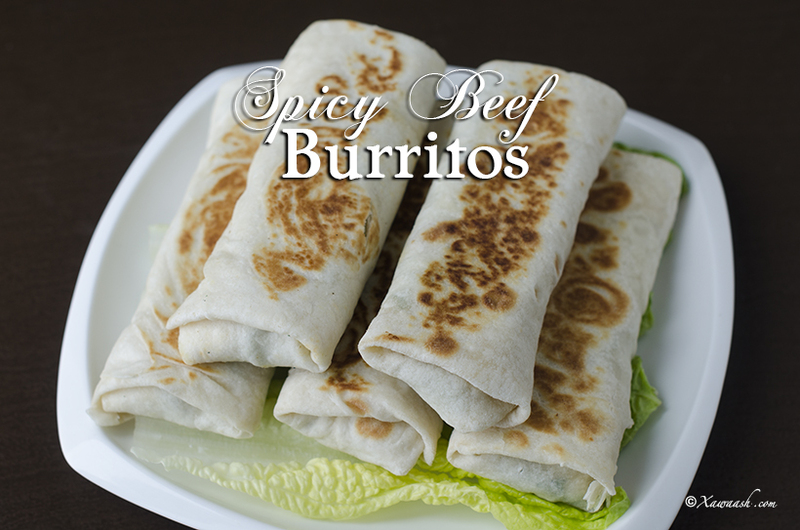 Steps for preparing the beef burritos. 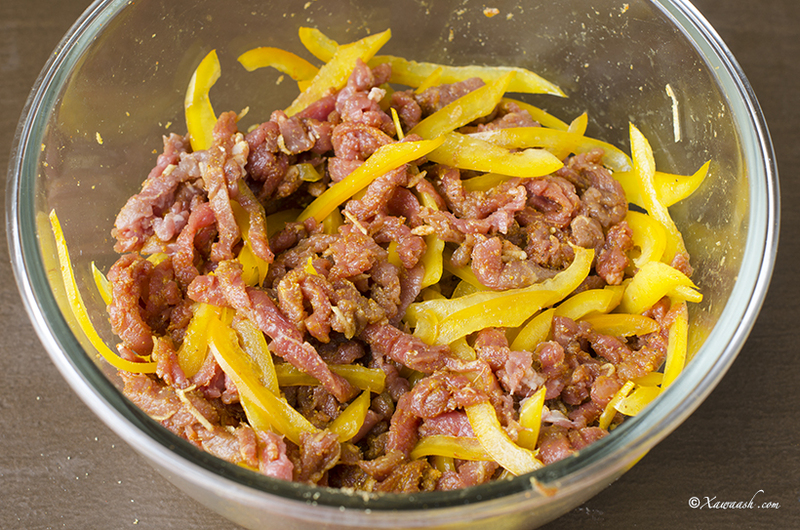 Partially freeze the beef, thinly slice across the grain then cut into thin strips. 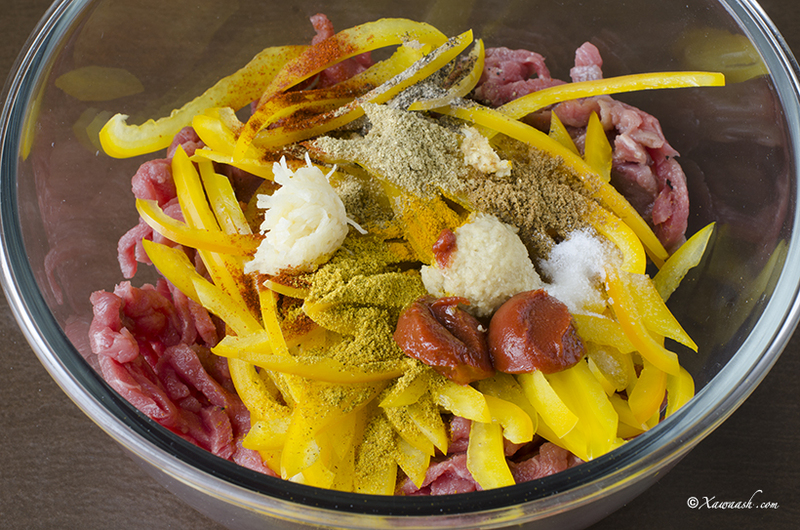 In a bowl, combine the beef strips, sweet pepper, paprika, curry powder, ground cumin, ground coriander, turmeric powder, grated fresh ginger, grated garlic, tomato paste, ground black pepper and salt. Mix well. Preheat the pan for 3 minutes using high heat, then add 1 tablespoon oil. 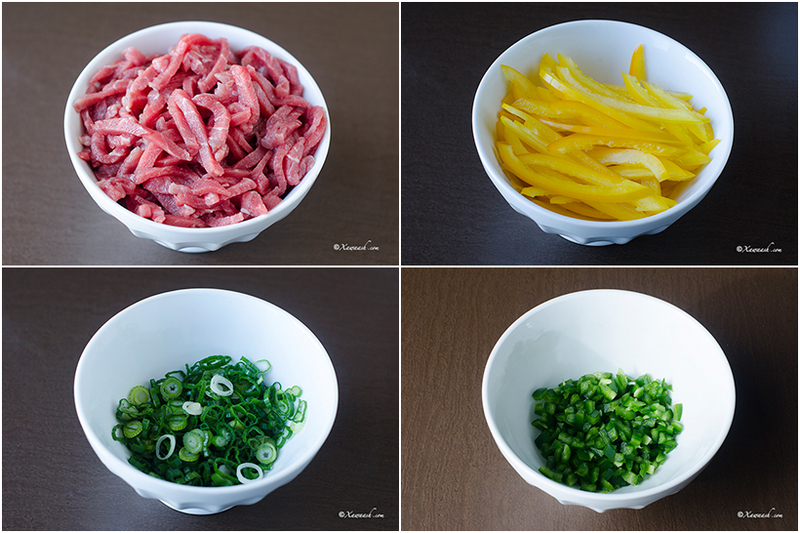 Stir fry for 2 minutes in small batches. Do not crowd the pan. Add the cilantro and stir. 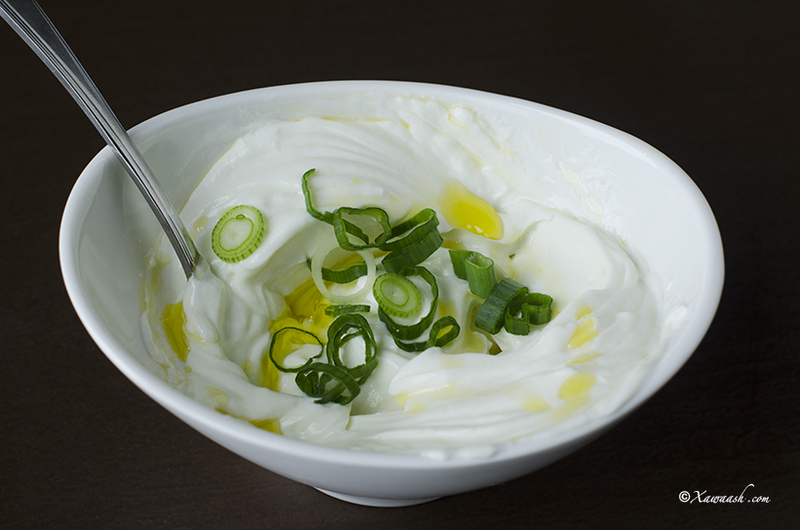 Combine the low-fat yogurt, salt and olive oil and mix well. 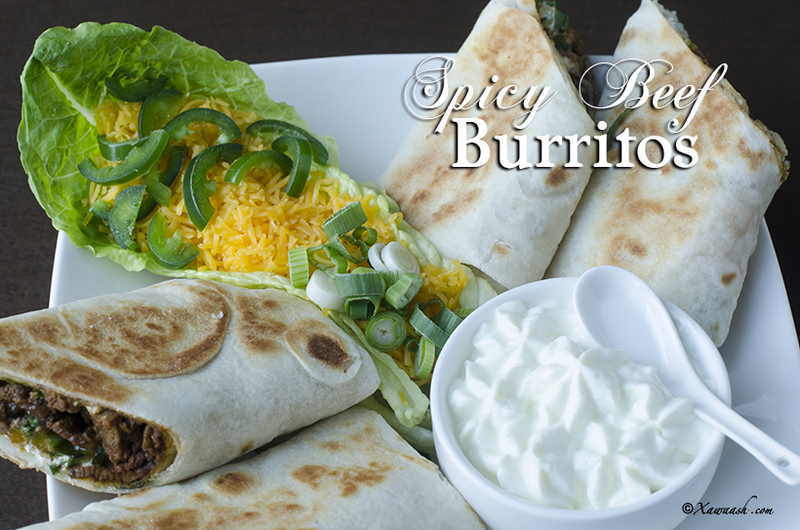 Place a small lettuce leaf on the burrito then spread some of the yogurt mixture. 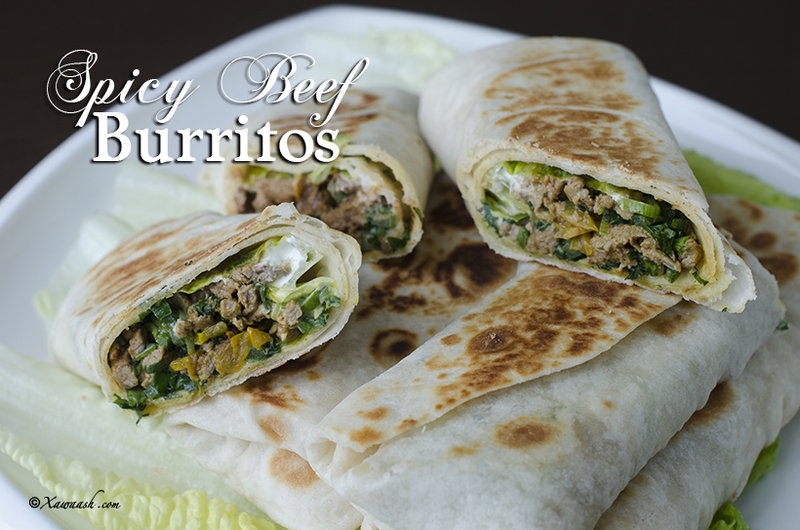 Place the stir-fried beef on the lettuce leaf and add some of the jalapeno peppers, green onions, cilantro and a few dollops of the yogurt sauce. Wrap as shown in the video and photo below. Brush both sides of the wrap with a little oil and cook for one minute on each side using medium heat. Hilibka xoogaa baraf ka dhig kaddibna qafiif u jar. Isku dar hilibka, barbarooniga, babriikada, keeriga, kaamuunta shiidan, kabsarada shiidan, huruudda shiidan, sanjabiisha la xoqay, tuunta la xoqay, yaanyo shiishiidka, filfisha madoow oo shiidan, iyo cusbada. Si fiican isku qas. Birta kululeey muddo 3 daqiiqo adigoo isticmaalaysa dab dheer kaddibna 1 qaaddo saliid ku shub. Hilibka hadba in yar dallac muddo 2 daqiiqo. Ku dar kabsaro caleen kaddibna walaaq. Isku qas caana fadhiga, cusbada iyo saliidda oliifada. Tortiyaha gabal insalaaddo saar, caana fadhigana mari. Hilibka aad dallacday insalaaddada kor saar. 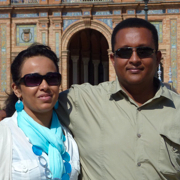 Ku kor dar basbaas halabeenyo, basasha cagaaran, kabsaro caleen iyo in kale caana fadhiga. Duubista waxaa ka arki kartaa fiidiyaha iyo sawirka. Labada dhinac saliid mari kaddibna dhinac walba hal daqiiqo dub adigoo isticmaalaysa dab dhexdhexaad ah. Nous appelons ces burritos au boeuf épicé non pas parce qu’ils sont piquants mais parce que nous les préparons avec des épices aromatiques: cumin, coriandre, curcuma, paprika, gingembre, poivre noir, et poudre de curry. Si vous adorez la nourriture piquante, alors amenez votre sauce de chili si vous venez manger les burritos que nous préparons. Si vous les préparez vous même et vous voulez qu’ils soient plus piquants, utilisez de la poudre de curry piquant, n’enlevez pas les graines des jalapenos, ou mieux utilisez des piments habaneros. Congeler partiellement le boeuf permet de le trancher finement en travers du grain puis de le couper en fines lanières. Nous avons fait revenir le boeuf dans très peu d’huile et il était si tendre qu’il fondait en bouche. Le coriandre, la laitue, les oignons verts, et la sauce au yaourt donnent un goût frais au burrito. Nous avons utilisé des tortillas faites maison et le résultat était vraiment spectaculaire. Congeler partiellement le boeuf, trancher finement en travers du grain, puis couper en fines lanières. Dans un bol, bien mélanger les lanières de boeuf, le piment doux, le paprika, la poudre de curry, le cumin moulu, le coriandre moulu, la poudre de curcuma, le gingembre râpé, l’ail râpé, le concentré de tomate, le poivre noir moulu et le sel. Préchauffer la poêle 3 minutes à feu fort, puis ajouter une cuillère à soupe d’huile. Faire sauter le boeuf deux minutes, en plusieurs fois. Attention à ne pas trop remplir la poêle. Ajouter le coriandre et tourner. Poser une petite feuille de laitue sur la galette puis étaler de la sauce au yaourt desus. Poser le boeuf sauté sur la feuille de laitue et ajouter les piments jalapeno, les oignons verts, le coriandre et quelques cuillères de sauce au yaourt. Plier comme montré dans la vidéo et sur la photo. Brosser les deux côtés du wrap avec un peu d’huile et cuire une minute de chaque côté à feu moyen. kheyr badan illah ha idin siiyo walalayal. Looks amazing walalo. Mashaallah! I always love your recipes. SERIOUSLY LOVE THIS WEBSITE! WAX LA MID AH LAMA HELO! WAAD KU MAHADSANTIHIIN!!! I HOPE YOU GUYS WILL BE AROUND FOR A VERY LONG TIME! We are happy to know that. Thank you very much for your wonderful comment. Masha Allah, I’m so Happy to see a website for somali food.Very professional! Thank you very much. We are happy you like the website and hope it will be useful to you. made this recipe yesterday and we love it so much. I even made the homemade tortillas. Great recipe! That is wonderful! Thank you for the great feedback. Mash Allah what an amazing website. I learned so much from it. Can I ask if I can do the same receipts with chicken insted of beef? You absolutely can. Thank you for your kind comment.